While there has been much hullabaloo about the Pollution Standard Index (PSI) in this unfolding haze saga – what with its inexplicable fluctuations, mismatch between what is observed and the figure published on the National Environment Agency (NEA) website, and the stubborn decision to issue 3-hour PSI average figures instead of the hourly measurements upon which these averages are calculated – a little (but critical) fact appear to have slipped under the radar of awareness. While the PSI may give a general snapshot of the hazy conditions, it may not be the best measure of the hazards we are facing here. Looking at all the six type of environment pollutant measures, what we all should really be looking at is the PM2.5 indicator. 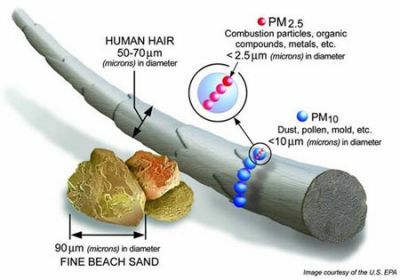 PM2.5 refers to particulate matter that is 2.5 micrometres in diameter or smaller, and comprises of combustion particles, organic compounds, metals and other ultrafine pollutants. The size of these particles is about 1/30th the average width of a human hair, and hence these are able to enter our lungs easily bypassing the nasal passage which traps the larger particles. In fact, their minute size enables PM2.5 particles to become deeply lodged in our lungs, even penetrating into the bloodstream, which can lead to other health issues. Long term exposure to PM2.5 has been known to cause premature death relating from heart disease, cardiovascular effects such as heart attacks and strokes, chronic respiratory illnesses and even cancer; while short term exposure can trigger non-fatal heart attacks, strokes and acute respiratory illness such as wheezing and asthma attacks. The NEA’s health advisory states that once PM2.5 concentration levels reach above 40, residents should start taking precautions such as reducing prolonged or heavy exertion outdoors. The same advisory puts the range of 150-250 as the upper limit where “everyone should avoid all physical activity outdoors” which is the same descriptor given for the ‘hazardous’ range in the PSI table. The consistently high PM2.5 levels appear to be the better indicator of the situation, which supports a stop-work order, especially for those who are required to work outdoors. The discretionary manner of ‘no hard line’, and no clear directives on issuing protective gear to those exposed to the elements, seems an overly simplistic approach in light of the very hazardous conditions. But whatever the case, please be proactive in protecting your health and take the necessary precautions such as staying indoors as much as possible and wearing proper masks (i.e. not the surgical ones or worse, handkerchiefs). With effect from 1 April 2014, NEA’s PSI reading, incorporated PM2.5 into the current Pollutant Standards Index (PSI) as its sixth pollutant parameter. The PSI will therefore reflect a total of six pollutants – sulphur dioxide (SO2), particulate matter (PM10) and fine particulate matter (PM2.5), nitrogen dioxide (NO2), carbon monoxide (CO) and ozone (O3). The 3-hr PSI will take into account PM2.5 concentrations.